Do These Homemade Fly Repellents Really Work? Most people don’t think about the complexities and issues that flies may present. They just think that they are annoying, uninvited house guests that want our food and buzz around our heads like the annoying little cretins they are. While this is true, flies are also potentially dangerous to humans, though it doesn’t seem like it. Most people are aware that upon landing on our food, flies vomit. While this is horribly disgusting, they also carry a plethora of diseases that could complicate our lives and be potentially fatal to human beings. Luckily, there are many ways in which to prevent them from entering our homes and transmitting these diseases. Flies can carry a host of diseases that are extremely harmful to humans. Raw meat attracts flies more often than not. Once they have landed on the raw meat, they can pick up or transmit the salmonella virus. This isn’t typically a fatal disease, but it it can cause some discomfort and what many people like to call food poisoning. Symptoms include fever, diarrhea, vomiting, abdominal cramps and other flu-like symptoms that could cause severe dehydration. Since flies are the most common carriers of this disease, it is extremely important that you take precautions and find ways to prevent them from inhabiting your home. Another aspect of flies that people are vastly unaware of is the many different species of flies that we come into contact with on a daily basis. Most commonly is the vexing house fly. This fly can be seen bothering you and your guests at a barbeque or picnic. They also tend to enjoy cheeseburgers and potato salad just as much as you and your relatives on the Fourth of July. Another common fly is the fruit fly. Is there a bowl of uneaten oranges on your kitchen table or countertop? Not anymore. These flies love breeding in your rotting fruit, veggies, and unintentional leaks from your refrigerator. Another fly that you probably see extremely often is the flesh fly. These files like to have parties on animal feces and also flock to your freshly opened steak to ruin your evening. Regardless of the type of flies inhabiting the area around your home, it is crucial that you identify their nesting grounds. Once this has been done, you can take the proper measures to kill and de-infest your home. There are several different repellents that work on killing nests and eradicating flies from your home. One of the most effective is a blend of vodka, aloe vera juice, lemon eucalyptus oil, and other essential oil blends. When applied to the skin and nesting areas, it repels the flies and it also smells divine, so it’s a win-win. Also, lemon grass oils are natural insect repellents. They’re also delightful in odor, so adding this to your list of fly repellents has multiple benefits. There are also tons of traps you can use in order to lure flies away from you and your food so that it can be enjoyed without having to swipe at the air every thirty seconds to deter the flies. Among the most effective are sugar-water traps and disposable fly traps. The construction of these traps allow easy entrance for the fly, but they cannot escape once inside. These designs are both clever and ingenious ways to trap the infernal pests that insist on invading your space every few seconds. If you are impatient and traps are too slow for you, there are also more conventional methods like using the ever-effective fly swatter. This allows you to take action into your own hands. This traditional tool can be found in houses across the nation. Its easy use and powerful outcomes have made it a household name among its victims. With new and improved solutions, there are also mechanical fly swatters that act as projectiles to launch your attacks from a distance, make it much more difficult for the flies to escape. This brings us to the bug zapper. The stupidity of flies and other insects never cease to amaze us. Bug zappers are tuned to powerful frequencies of light to kill the bugs on contact. These bugs are attracted to it so often, you might find yourself in need of cleaning the zapper daily in order to keep it from tipping off the flies. But why stop there? Turn nature against the flies with a Venus Fly Trap. This is a plant that operates on a hinge. When the sensory bristles located on the lip of the plant are alerted, usually by a fly, the trap snaps shut and consumes its victim. 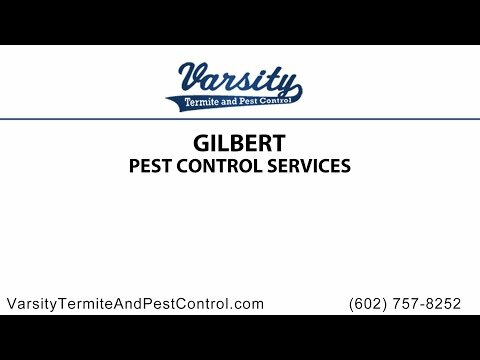 Despite the many different ways to trap, kill, and prevent flies, there is always one solution that will work for years to come: Gilbert pest control. Varsity Termite and Pest Control services are the way to go. We can help you eradicate your fly problems and make sure that you and your family are safe and secure from these infernal, bothersome bugs. Our experts have the knowledge and experience you need in order to keep them away from your potato salad. So call Varsity Termite and Pest Control today at (602)-757-8252 and we will eliminate flies from your life.